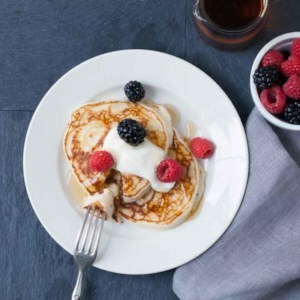 Find healthy, delicious buttermilk pancake recipes, from the food and nutrition experts at EatingWell. 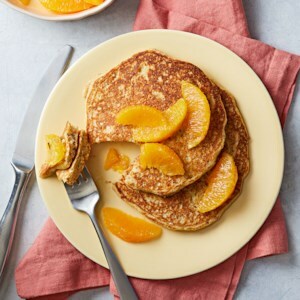 Boost your breakfast with vitamin C and potassium by topping your whole-grain pancake stack with segmented oranges, which are an excellent source of both. 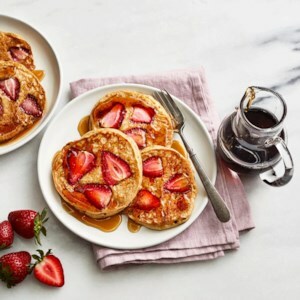 Serve these honey-sweetened wheat-and-oat buttermilk pancakes with sliced fresh fruit and your favorite flavored yogurt instead of the strawberry syrup. 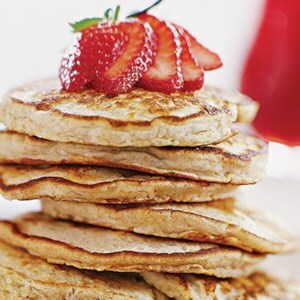 Make classic light and fluffy pancakes gluten-free with this easy recipe. Try them topped with yogurt, maple syrup and fresh berries for a satisfying breakfast. 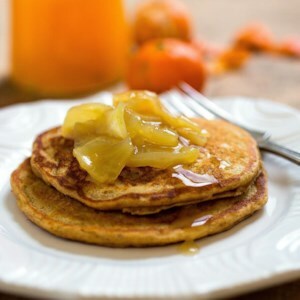 This healthy whole-grain buttermilk pancake recipe uses 100% whole-wheat flour, heart-healthy canola oil and just a tablespoon of sugar. Compared to most store-bought mixes or a classic recipe, this recipe saves about 30 calories, 3 grams saturated fat and 4 grams total sugar per serving, plus you'll dish up 2 extra grams of fiber. If you want to experiment with different types of whole grains, replace up to 1/2 cup of the whole-wheat flour with cornmeal, oats and/or buckwheat flour. Or add extra fiber and omega-3s by adding up to 3 tablespoons of ground flaxseed or chia seeds. 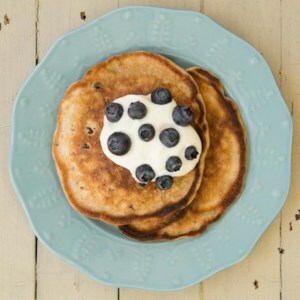 With this whole-grain mix on hand, you can enjoy homemade pancakes on busy weekday mornings. This is also a great item to pack on camping trips. Be sure to refrigerate or freeze the mix as flaxseed meal is highly perishable. 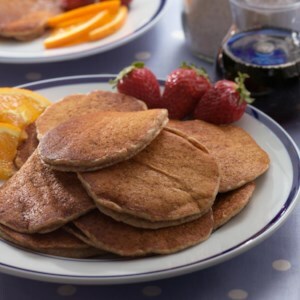 This healthy whole-grain pancake recipe uses 100% whole-wheat flour, pumpkin pie spice, applesauce and molasses for the unmistakable gingerbread flavor. If you want to experiment with different types of whole grains, replace up to 1/2 cup of the flour with cornmeal, oats and/or buckwheat flour. Or add extra fiber and omega-3s by adding up to 3 tablespoons of ground flaxseed or chia seeds. 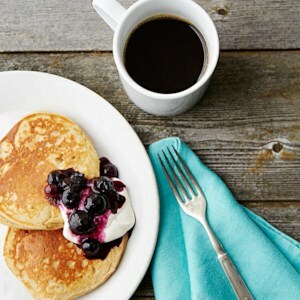 This healthy whole-grain blueberry pancake recipe uses 100% whole-wheat flour, heart-healthy canola oil and just a tablespoon of added sugar. If you want to experiment with different types of whole grains, replace up to 1/2 cup of the flour with cornmeal, oats and/or buckwheat flour. Or add extra fiber and healthy omega-3 fats by adding up to 3 tablespoons of ground flaxseed or chia seeds. 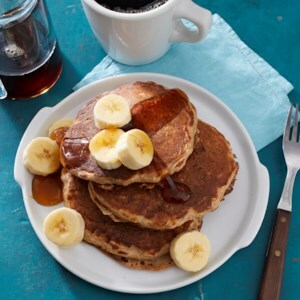 This healthy whole-grain buttermilk pancake recipe adds mini-chocolate chips and mashed banana to the 100% whole-wheat flour base. 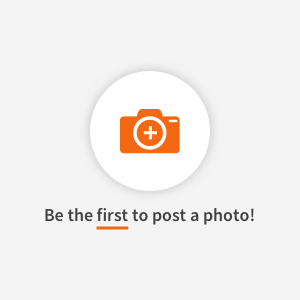 If you want to experiment with different types of whole grains, replace up to 1/2 cup of the whole-wheat flour with cornmeal, oats and/or buckwheat flour. Or add extra fiber and healthy omega-3 fats by adding up to 3 tablespoons of ground flaxseed or chia seeds. Change up your Sunday morning pancake routine with this savory pancake recipe studded with sausage crumbles and shredded sharp Cheddar. 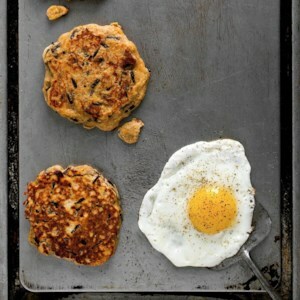 Serve these healthy pancakes with fried eggs and slices of fresh tomato. 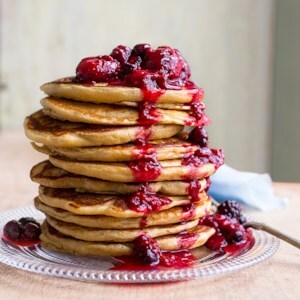 Depending on the type of protein powder you pick, you might need to reduce the amount of liquid in this protein pancake recipe. 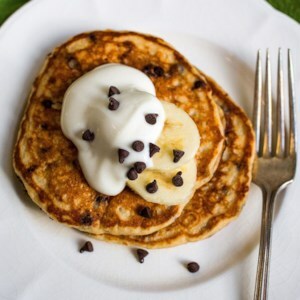 Whey-protein pancakes need less liquid than those made with soy, hemp or pea protein. Serve with yogurt and a DIY fruit sauce (warmed frozen berries with a pinch of sugar). 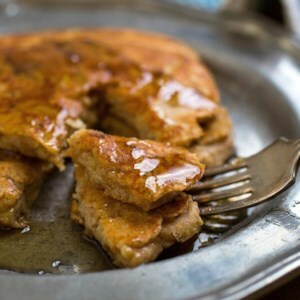 This healthy whole-grain apple-cinnamon pancake recipe uses 100% whole-wheat flour, heart-healthy canola oil and just a tablespoon of added sugar. If you want to experiment with different types of whole grains, replace up to 1/2 cup of the flour with cornmeal, oats and/or buckwheat flour. Or add extra fiber and healthy omega-3 fats by adding up to 3 tablespoons of ground flaxseed or chia seeds. 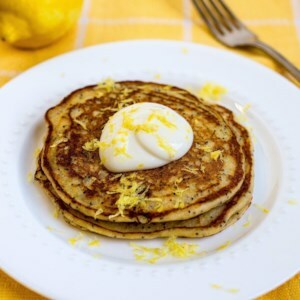 This healthy whole-grain lemon-poppy seed pancake recipe gets a protein boost and an amazing texture from the addition of part-skim ricotta cheese. If you want to experiment with different types of whole grains, replace up to 1/2 cup of the whole-wheat flour with cornmeal, oats and/or buckwheat flour. Or add extra fiber and omega-3s by adding up to 3 tablespoons of ground flaxseed or chia seeds. If you like apple pancakes and you like bacon, you'll love the taste of these sweet, smoky pancakes. Any kind of apple works well. A quick cider syrup drizzled on top enhances the apple flavor. 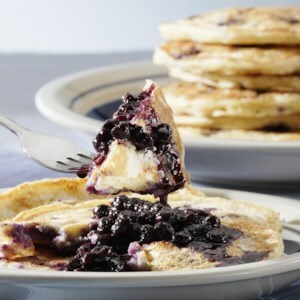 Dried blueberries give these pancakes a rich blueberry flavor and pecans liven up the texture with a bit of crunch. EatingWell reader Kathy Moseler of Barrington Hills, Illinois, contributed this convenient recipe to our Kitchen to Kitchen department. 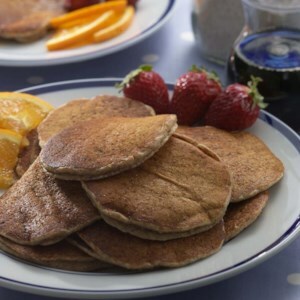 The pancakes are made with 100 percent whole-wheat flour and get an additional fiber boost from flaxseed meal. 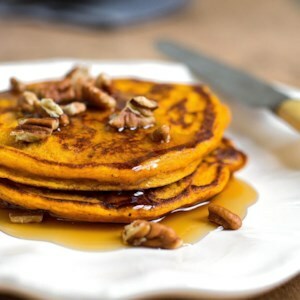 These spicy gingerbread pancakes are delectable served with maple syrup, Vanilla Cream or Warm Lemon Sauce.